Made by Keys Fitness, Ironman treadmills are increasing in popularity for home users. 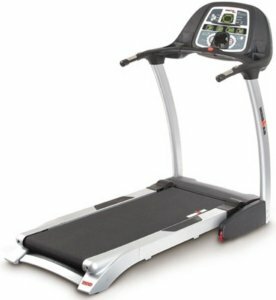 The moderate price range of $800 to $2000 indicates that these are treadmills that are higher in quality and the price is certainly right for what you get. Recently, the manufacturing of the parts for Ironman treadmills has gone overseas, which has resulted in some problems with the treadmill design as well as with some of the electronic components. This can be problematic as soon as you purchase your treadmill and it causes us to question the future that’s in store for this brand. One of the surprising finds with Ironman is that they try to offer higher quality parts for the prices they are selling their products at. Consistently, users and experts rate these treadmills as sturdy as they are steady in their movement. The surface isn’t too thick as to wear down the motor – and this is where so many other similar models fail. A thicker running surface needs more power with each revolution and that can cause motors to burn out before you’ve even reached your fitness goal. With a model that offers a TV, you might think that Ironman treadmills aren’t serious about fitness, but that’s simply not the case. 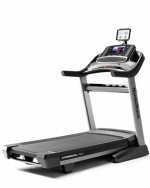 These treadmills offer great features and a nice look, though that’s probably not going to help your fitness goals, unless style is important to you. Coming in fun colors like red, black and silver, it’s certainly a brand that lives up to its Ironman-ness. UPDATE: Ironman Fitness no longer manufactures treadmills, sticking only with their elliptical line. For a similar machine take a look at NordicTrack. What is helping the Ironman brand of treadmills to get into more homes is their lifetime frame and ten year motor warranty. A warranty such as this will certainly help you get the most for your money. However, if you’re spending your time calling the service man, how much running are you getting in? There’s no denying that Ironman treadmills are certainly built with the athlete in mind – and the stylish athlete, no less. There are moderately priced models for the in-home exerciser and that’s redeeming the brand and making it a fixture in the future. The Keys line may have begun with weights, but it will continue with treadmills. Your Ironman treadmill will have the service it needs…and it may very well need it as they work out the kinks in the outsourcing process.